So I’ve mentioned previously that I am not a baker, and I hate to bake! This holiday season I did make some Christmas goodies using only my microwave, a bowl, and a spatula! These recipes are super easy and delicious! 1. Melt the white chocolate baking chips in a microwave safe bowl. Microwave until the baking chips are soft. Then, using the spatula, stir until completely melted and smooth. 2. Cover the bottom of a baking dish with wax paper (I used a 8×8 baking pan) and pour the melted white chocolate into the pan. 3. Crush candy canes with a rolling pin in a Ziploc bag. (I used 5 candy canes). 4. Sprinkle the crushed candy canes over the white chocolate. 5. Cover and put in the refrigerator for 30 minutes. 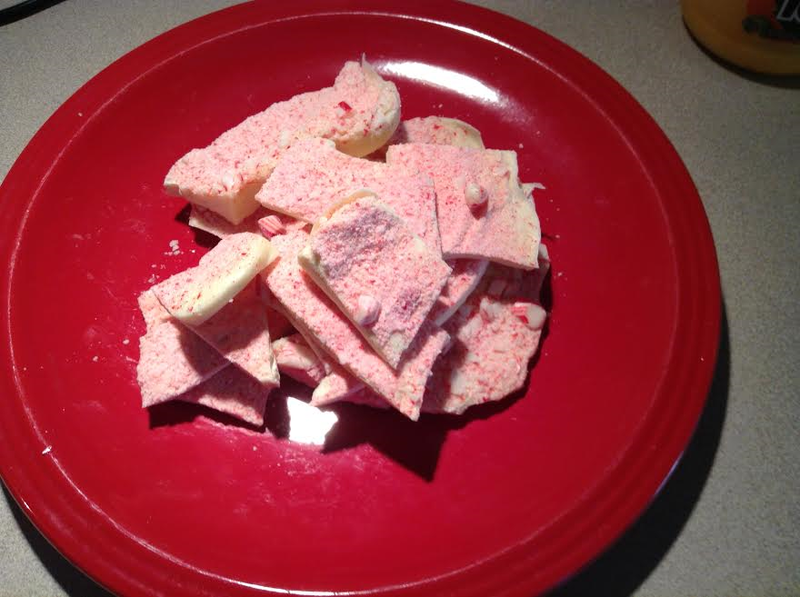 Remove from refrigerator and break the peppermint pieces using your hands. 1. Remove the wrappers of the Hersey’s Kisses and place in a microwave safe bowl. Microwave until soft. Then, using the spatula, stir until completely melted and smooth. (If chocolate is too thick, add a drop of vegetable oil to make it smooth and creamy). 2. Cover baking sheets with wax paper. 3. Pour chocolate into an appropriate size cup to dip the pretzel into. 4. Dip pretzel rods into cup with chocolate and gently tap the pretzel on the side of cup to remove excessive chocolate. 5. 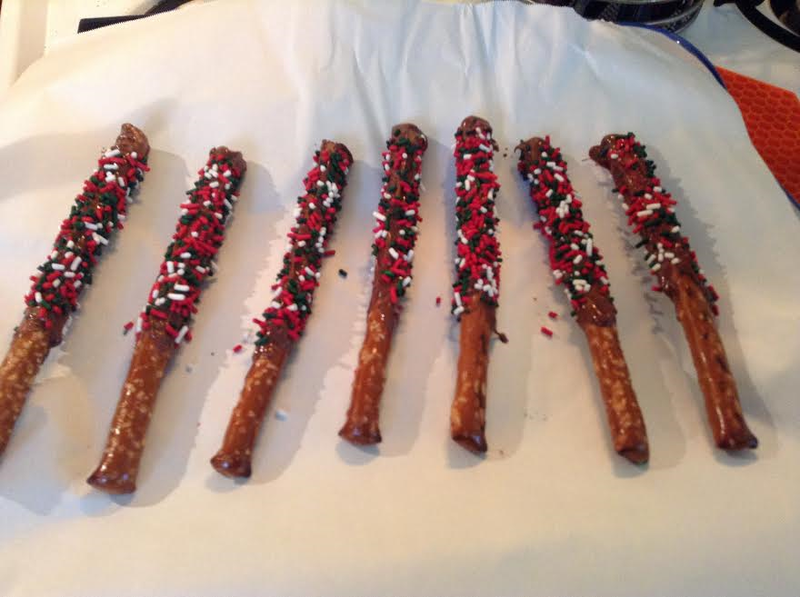 Sprinkle with holiday sprinkles and place on wax paper covered baking sheets. 6. Place chocolate covered pretzels into refrigerator for 30 minutes to harden. Well there you have it; two simple recipes that require very little time to make. These treats are perfect to have sitting on a plate for your guests to snack on this holiday, or they would make a perfect gift for someone. (Just wrap them up with pretty cellophane and tie with a bow). Well I hope every has a fabulous Christmas!